This paper builds upon the risk-sharing view of NGDP targeting. The basic idea is that in a world of fixed-price nominal debt contracts (i.e. the real world), a NGDP level target provides better risk sharing among creditors and debtors against economic shocks than does a price stability target. This is because a NGDP level target makes inflation countercyclical. During recessions, inflation rises and causes creditors to bear some of the unexpected pain by lowering the real debt payments they receive from debtors. During booms, inflation falls and allows creditors to share in some of the unexpected gain by increasing the real debt payments they receive from debtors. Debtors, in other words, bear less risk during recessions but also share unexpected gains during expansions. 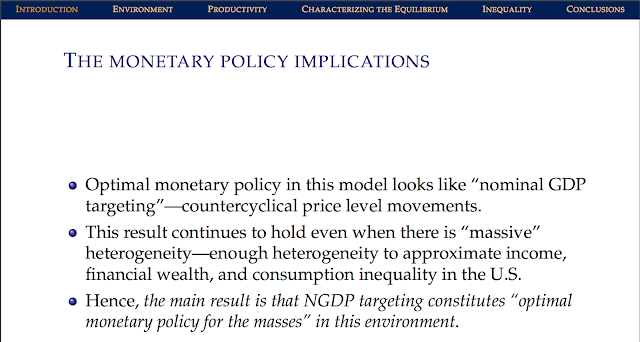 NGDP level targeting, in other words, causes a fixed-price nominal debt world to look and feel a lot like an equity-world. In a similar spirit, some observers have called for a risk-sharing mortgages as a way to avoid another Great Recession. The point of this paper is that the same benefit that such risk-sharing mortgages would bring can be had by having a central bank target the growth path of NGDP. 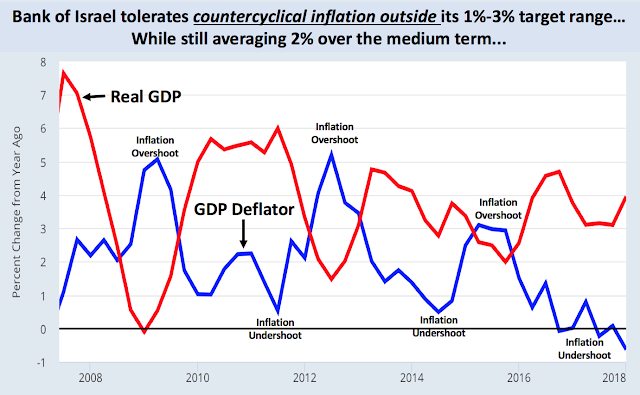 Note that both inflation overshooting and undershooting have been tolerated. The GDP deflator has been as hight as 6 percent and almost as low as 1 percent. Overall, its inflation rate has averaged about 2 percent, right in the center of the 1-3 percent target range. So this approach provides both a nominal anchor and short-run inflation flexibility for Israel. This is what monetary policy for the masses looks like! 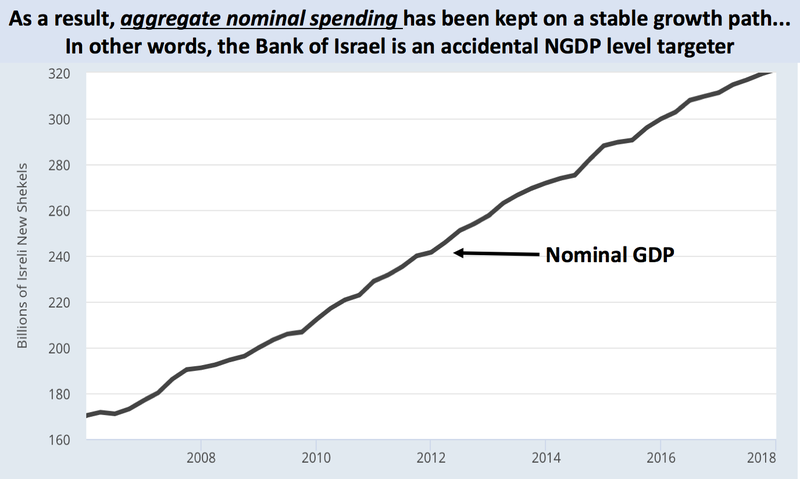 Let me learn more about how Israel has been performing very well under the NGDP targetting. Tomo, as I mentioned in the post, Israel is not explicitly doing NGDP targeting. Rather, its actions are consistent with NGDP targeting. Larry Summers says target NGDPLT at 6% annual growth. I have been saying that since 2008! Incidentally, how do you assess the recent FOMC action, particularly in light of NGDP targeting policy? It seems to me FRB is far behind the curve, since US real GDP appears to be growing at close to 5% during Q2 2018 according to GDP Nowcast. The US nominal GDP is presumably ruuning at around 6-7% in 2018, while the US policy interest rate has been just raised to no more than 2%. US NGDP level targeting policy appears to me to suggest the similar story above. In fact, just now, I am disapponted to have observed that the BOJ did not change its monetary policy at all in its statement issued this morning. In my view, all central banks including FRB are failing to recognize the need to monitar developments of nominal gdp of each economy, or significance of NGDP (level) targeting policy. Beckworth has interviewed both Scott Sumner and Roger Farmer about combining NGDP targeting with an NGDP futures market and the commitment of the Fed to buy or sell debt instruments (Sumner) and/or equities (Farmer) if the futures market is below or above the target. Larry Summers' view of NGDP targeting slowly evolved over the past few years, going from mild statements of approval to his written endorsement. To his credit, Beckworth has given Sumner and Farmer a platform to both educate others and promote the concepts. Very good but the model is too simple to accommodate the need for an optimal amount of inflation (the amount needed to mitigate price stickiness). And if the amount of stickiness changes over the business cycle, one still needs a "dual mandate." And unless the monetary regime actually eliminates changes in real interest rates and fluctuations in the difference between aggregated resource demand and resource supply (unemployment of some resources) a government following an invariant NPV rule for expenditures will still carry out what looks like countercyclical fiscal policy. Conclusion: we still need active monetary and fiscal policy, even if we agree that a monetary of targeting NGDP at the pre-recession rate would have been vastly better than the ineffective fiscal policy and the inactive mal-active monetary policy that we in fact got. How to reach NGDP of 6% in face of the "savings glut"? More QE just means more asset inflation. Real helicopter $ (not just a channel through the banks) appears unavoidable. A helicopter drop-linked NGDP target! 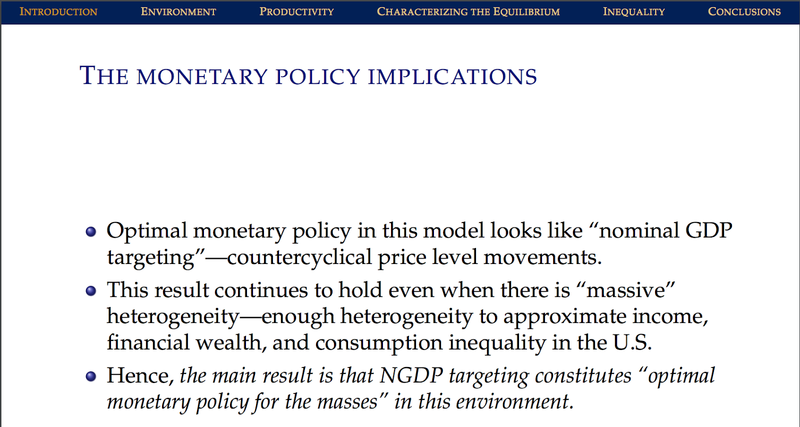 David, what is missing here is the counterfactual: What would RGDP have looked like absent NGDP targeting? We can't just presume that because NGDP evolves in a stable manner that the path (or volatility) of RGDP is optimal (or better, in some sense, relative to what it otherwise may have been). 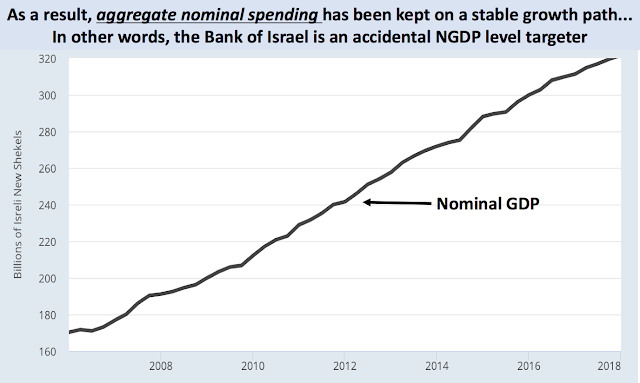 I am not a conspiracy theorist, but I can't look at the stability of Israel's NGDP in that chart and believe it is real unless 1) luck, 2) omniscient and omnipotent central bank, or 3) some quirk in how they measure things. Does one really think that a central bank can manage a 4+% decline in RGDP (~2012) to be almost perfectly offset by a ~5% increase in inflation? Shouldn't we be expecting some lags here? I say call an Israeli economist before betting the farm on it. This data seems to match the RGDP and GDP Deflator data, but the NGDP growth reported in the same site looks much more volatile. It is hard to guess growth rates in the NGDP level graph.